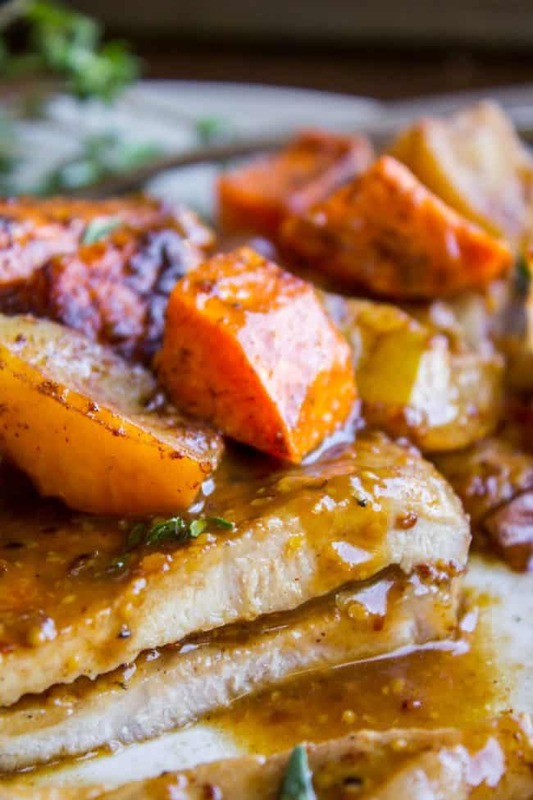 Pan Seared Pork Chops are such an easy weeknight dinner! They are done in just a few minutes, and finished off in a delicious apple cider glaze. Pair it with cinnamon-spiced roasted apples and sweet potatoes, and it will smell like autumn in your house in no time. I’m now accepting any and all ideas for genius kid’s Halloween costumes that are cheap and easy (read: sewing is neither cheap nor easy.) 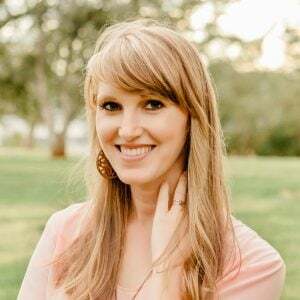 My kids are still young enough that they are strongly open to suggestion, so I always try to get them to choose something that is creative but doable. I’m like a roller coaster when it comes to Halloween costumes: half the time I’m totally gung-ho about it (memories! Fun times! ), but there is this other Scrooge-y part of me that is incredibly cheap and can’t handle spending tons of money on something my kids are only going to wear once. To get in the fall spirit, we headed up to Apple Hill last weekend, which is kind of like the pumpkin patches you’ve been too, but it’s all apples and orchards instead of pumpkins and vines. They have the BEST apple cider there, and also amazing apple cider donuts that are to die for. I also bought 8 ounces of caramel for $12, which sounds crazy, but since then I’ve made multiple batches of (failed) caramel to try and recreate it. The kind at Apple Hill makes the best caramel apples. Stay tuned, I WILL CONQUER! I will go broke spending that much on caramel, I’m addicted and I need a home remedy. 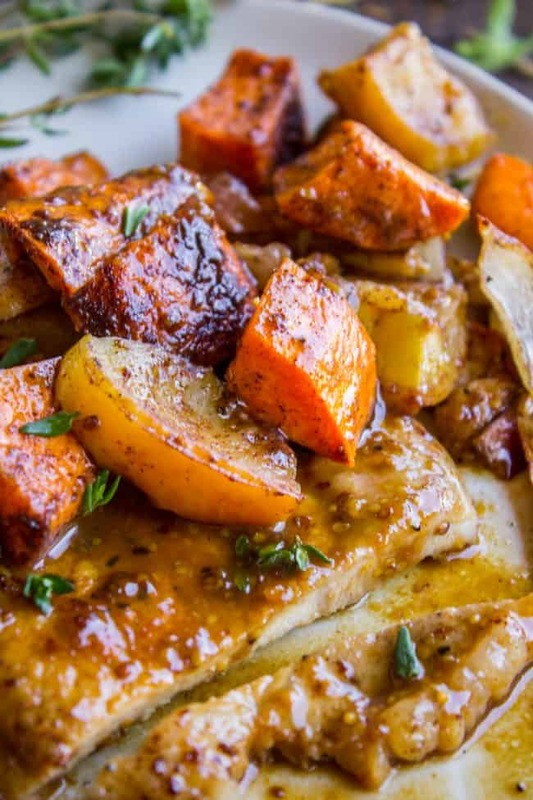 I used the apple cider and apples we bought to make these fall-inspired pan seared pork chops. I roasted the apples with sweet potatoes and onions. Pork chops and apples just go together, right? And roasted sweet potatoes are my favorite. This recipe for Roasted Sweet Potatoes and Brussels Sprouts is one of the most popular recipes on my blog. 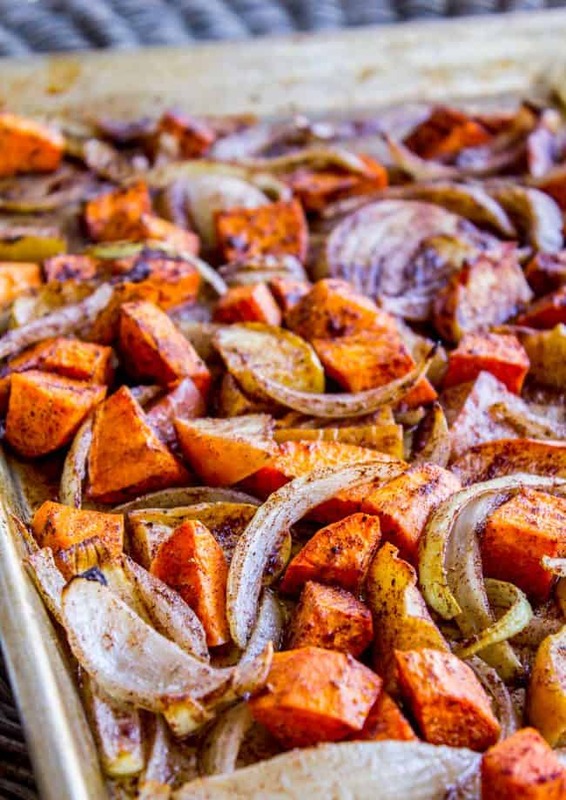 Today’s recipe calls for cinnamon on the roasted veggies and apples, and also a bit of brown sugar. It gives it just a little touch of sweetness that makes you want to eat it like candy. I was this close to posting these roasted sweet potatoes and apples with cinnamon as a whole separate recipe. You could serve it with lots of different main dishes, and it’s so good! While researching this recipe, I picked up a tip in my Cook’s Illustrated book. When you make pan seared pork chops, they tend to curl up a bit because of the line of fat on the out edge. 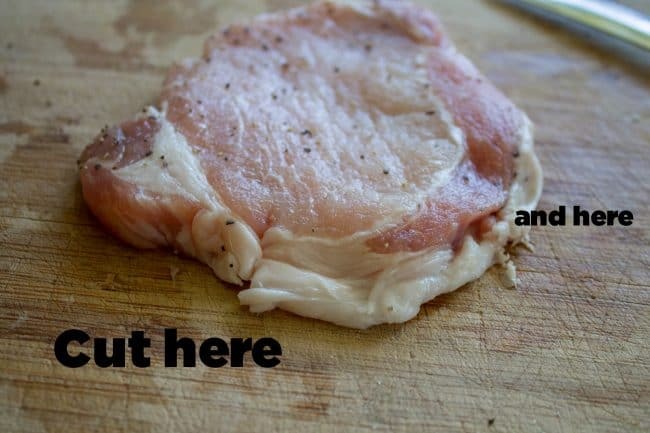 Here’s how to snip the edges of your pork chop to avoid that. It’s not the end of the world if you skip this step, but it is nice to be able to cook your pork chop evenly. Sometimes they curl up so much that they don’t sear well. If you forget to do it ahead of time and notice them curling, you can snip them even after the initial sear (I’ve tried it). 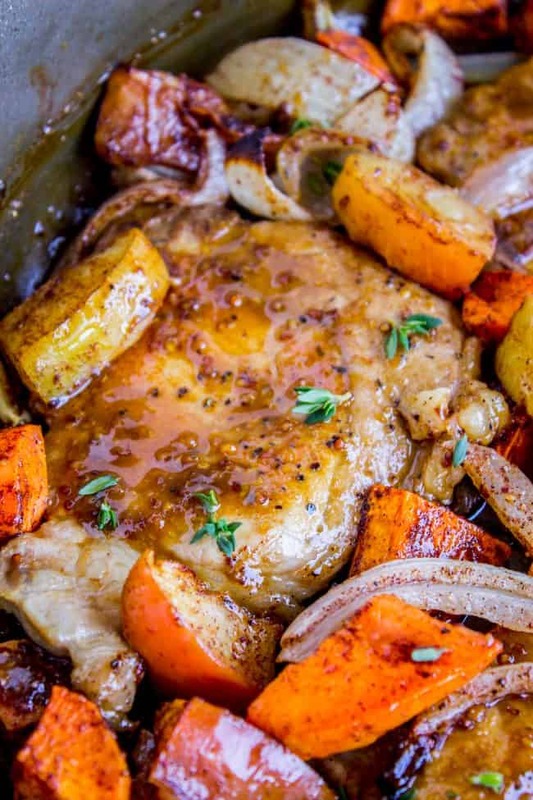 Preheat your oven to 400 degrees F. Line a large baking sheet with foil or parchment paper. Chop the sweet potato into 1 or 2 inch chunks. Peel the onion and slice into wedges. Core the apples and cut into about 8 slices each (leave the peel on the apples). 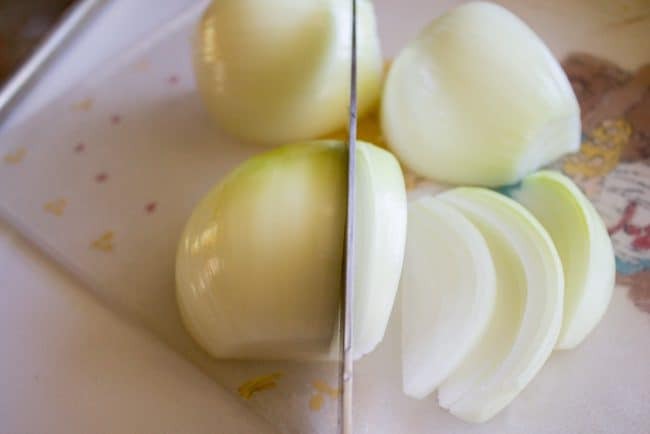 Smash the garlic with the side of a chef's knife. 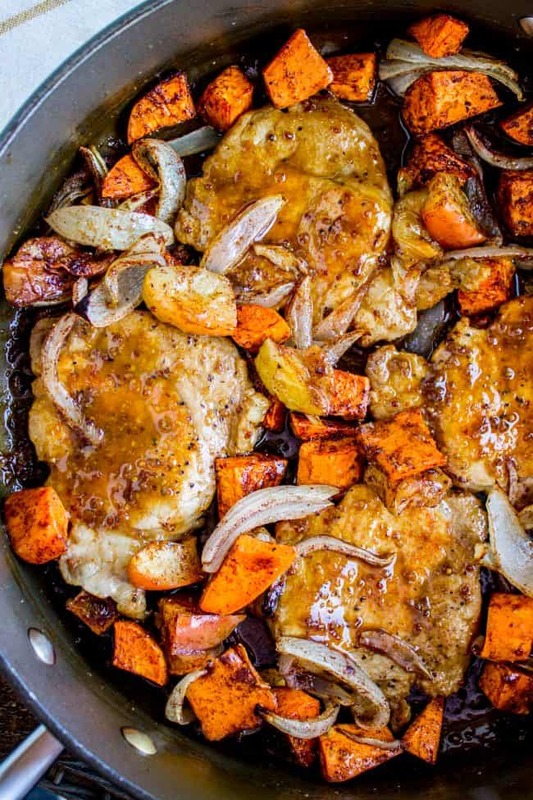 Add sweet potato, onion, apples, and garlic to the pan. Drizzle with 1/3 cup olive oil. In a small bowl, combine cinnamon, garlic salt, kosher salt, pepper, and brown sugar. Sprinkle over the pan and then use your hands or a wooden spoon to mix it all together. Make sure everything gets coated with oil and the spices, then spread it all out on the pan in one layer. Roast at 400 for about 30 minutes, or until you can slide a fork into the sweet potato and apples. Remove from the oven and keep warm. Heat a large skillet over medium high heat. When hot, add about 1 tablespoon olive oil. When the oil shimmers, add the pork chops one at a time, with plenty of space in between. Sear over medium high heat for about 2 minutes until golden brown, then flip each pork chop and sear the other side. If you have more pork chops, work in batches. Don't add more than about 4 to the pan, otherwise they will steam and not get a golden sear. 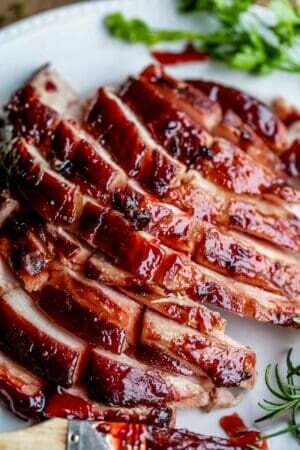 Remove the pork chops to a plate and set aside. Simmer for about 5 minutes, until slightly thickened. Add 3 tablespoons of butter and continue simmering until melted. 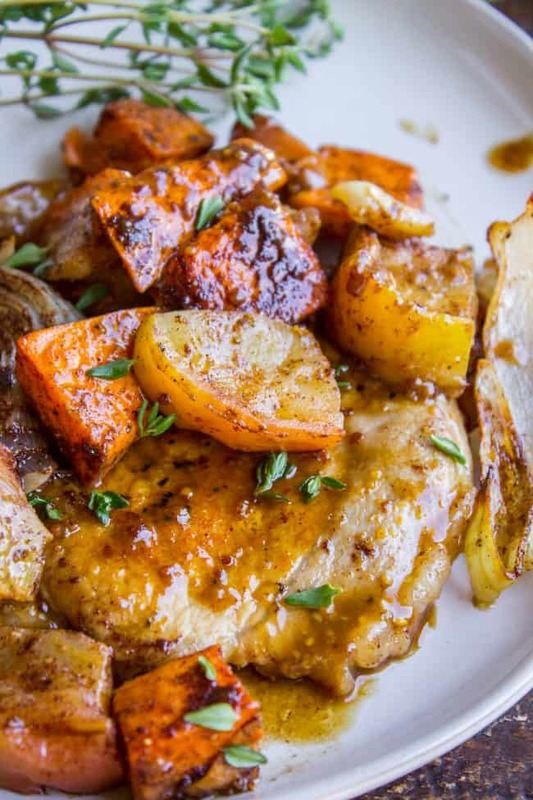 Serve the pork and the roasted veggies with the apple cider glaze drizzled over the top. Or you can dump the veggies into the pan you cooked the pork in, whatever works for you. Garnish with fresh thyme or rosemary. 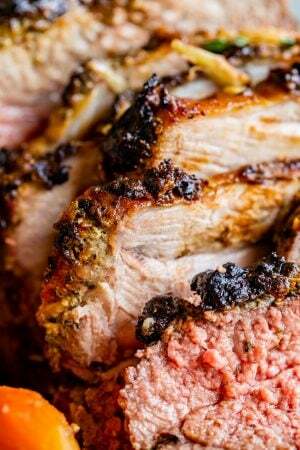 *I bought thin cut pork chops for this recipe, it was probably about a pound of meat total. If you buy thick cut pork chops, that will work fine too. Sear for the same amount of time, but you will need to cook it in the apple cider mixture longer, until it reaches 145 degrees. 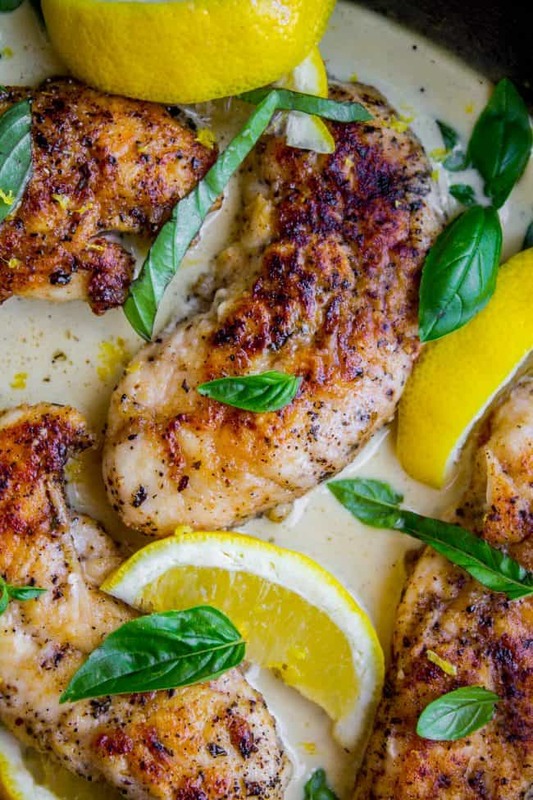 More easy dinners you will love! 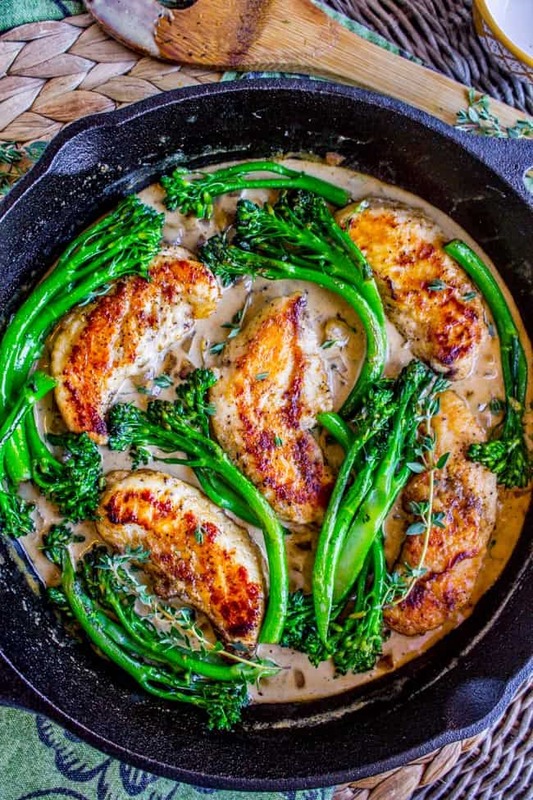 Pan Seared Chicken and Broccolini in Creamy Mustard Sauce << huge reader favorite! 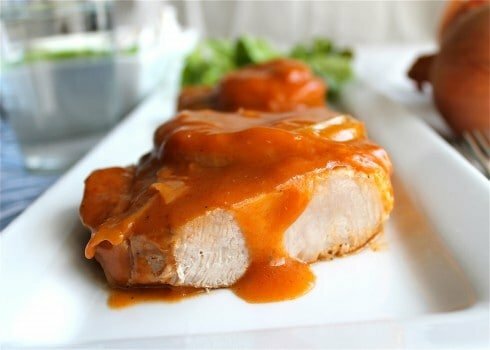 Saucy Pork Chops << this was my favorite meal as a kid. My mom made these pork chops on special occasions. It’s really simple, but it’s so good! 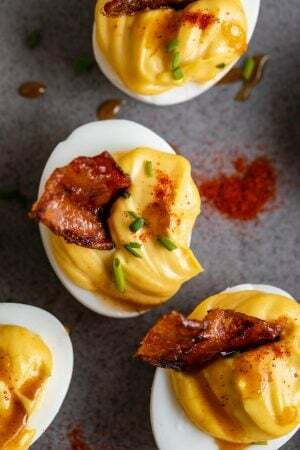 I’ve been stuck in a rut with dinners lately, so I hopped on Pinterest and found this recipe. It was SO. GOOD!!! I was drooling as it cooked because it smelled like fall, and my husband couldn’t stop raving about it while we ate. Three out of my four kids even enjoyed it! (Success, ha!) 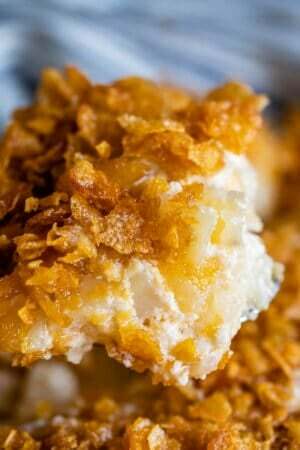 This will definitely be added to our dinner rotation and I also shared the recipe with my sister in law! Thank you! So tasty!! I can’t believe how easy it was to make. It’ll be saved with my favorites! Very easy and quick to put together. The flavors were a nice change..
Beautiful. I love the combo of sweet potatoes and apples. I’ve even used crabapples! And you’re right – they is no excuse for a poorly cooked pork chop. Or any cut of pork. Everyone needs to know how to prepare meat; the rest is cake! Crabapples, really?? I’ve never cooked anything with crabapples, now I’m totally curious!! I’ve been wanting Alyvia and Tori to be Lucy and Ethel. It would be so cute to have Valentine and Charlotte be Lucy and Ethel and Truman could be Ricky! Ha! That’s such a cute idea!!! Looks like a perfect fall meal. I will try this, I love to make glazes. Never used apple cider sounds good. That’s the exact one that I found, Robert! I was considering it! It doesn’t looks too difficult. We will see if he changes his mind again! Ooh that’s a great idea Mary!! I really like the crazy eyebrows idea. sounds cheap and easy, my favorite 2 things ;) we will see if I can convince truman!! This looks awesome. I’m making it asap, thanks! Thanks Sue! I hope you love it as much as we do!